At Hazelwood Allied Moving and Storage we know something about the importance of family. Servicing Santa Barbara, Montecito, Hope Ranch, Goleta, Santa Ynez, Solvang, San Luis Obispo, Ojai, Ventura, Camarillo, Thousand Oaks and Los Angeles, Hazelwood Allied is one of the oldest family-owned businesses in the Tri-County areas. My wife, Janet, and I both work in our family business and we are proud to say that our son Casey in involved as well. In fact, Casey was recently designated as a Certified Relocation & Transition Specialist. We are all committed to upholding high standards of quality, customer service and client satisfaction. Our family enjoys the relationships we develop with customers, and we cherish the trust they place in us. Our entire staff also takes pride in our integrity, sound work ethic, and commitment to our clients and our local community. That’s why we want to take this time to say Happy Thanksgiving to our clients, our family, our dedicated staff, and our friends. We are thankful that we can meet so many wonderful people throughout the year and help with their moving and storage needs. Whether you are relocating to Santa Barbara, moving across town, or relocating your business, we know you have many things on your mind and don’t need to worry about your possessions or office equipment. Our impeccable track record is indicative of our commitment to a thorough and careful approach to packing, transportation, and storage. If you need to move during the busy holiday season our quality movers will make the process easy for you so you can concentrate on what is most important - spending time with loved ones. If your home is getting a little crowded with holiday guests our Santa Barbara storage facility might offer the perfect solution. McCann Mini Storage is located in a safe residential neighborhood right next to Santa Claus Lane off the 101 Freeway. It has over 400 units ranging in size from 5X6 to 20X20 to accommodate any short or long-term storage needs you may have. We can even arrange transport of your items from your house to the storage facility and back again after the holidays are over. Whatever your plans may be for this year, Happy Thanksgiving from our family to yours! May you remember all the things you have to be thankful for this year. About Hazelwood Moving and Storage - Customers refer to Hazelwood Allied Moving and Storage as one of the most professional self-storage and moving companies Santa Barbara has to offer. Santa Barbara businesses and home owners rely on the full-service relocation company to handle everything from family heirlooms to rugged business equipment. 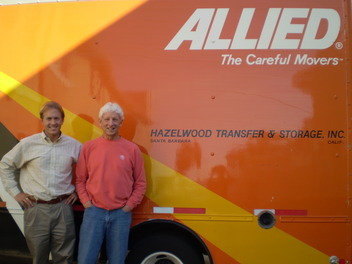 Since 1918, Hazelwood Allied nationwide movers have maintained a commitment to quality and customer service. When using these quality movers, Santa Barbara customers can sit back and let Hazelwood carry the load. Visit the website and Facebook page or call 800-541-5958 for more information or to schedule a complimentary move analysis. "If your home is getting a little crowded with holiday guests our Santa Barbara storage facility might offer the perfect solution. McCann Mini Storage is located in a safe residential neighborhood right next to Santa Claus Lane off the 101 Freeway." This just lighted a bulb in my head... :) I've already been planning on how to re-arrange my furniture and things to clear some space for visitors this coming Christmas and New Year. I'm so happy to have read this!